TORONTO, ON – First announced in 2007 and eagerly awaited since, The Oxford Companion to Beer is now available. Edited and curated by Brooklyn Brewery brewmaster and leading beer expert Garrett Oliver, the 900+ page tome is the most ambitious and comprehensive reference book on the topic of beer and brewing ever published. Primary Canadian content is provided by Toronto Star beer critic Josh Rubin, who contributes a four page entry on beer in Canada, and a shorter entry on Labatt Brewing. Other Canadian contributors include: Mirella Amato of Beerology; Jonathan Downing of Downing Beer Consulting; Michael J. Edney of Winnipeg’s Grain Research Laboratory; Brian Harvey of the Department of Plant Sciences, University of Saskatchewan; Bev Robertson of the Department of Physics, University of Regina; and Igne Russell, editor of The Journal of the Institute of Brewing. 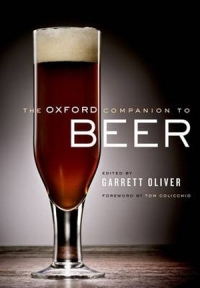 The Oxford Companion to Beer is available now at online and traditional booksellers for a suggested retail price of $65.00. More information can be found on the Oxford University Press website.